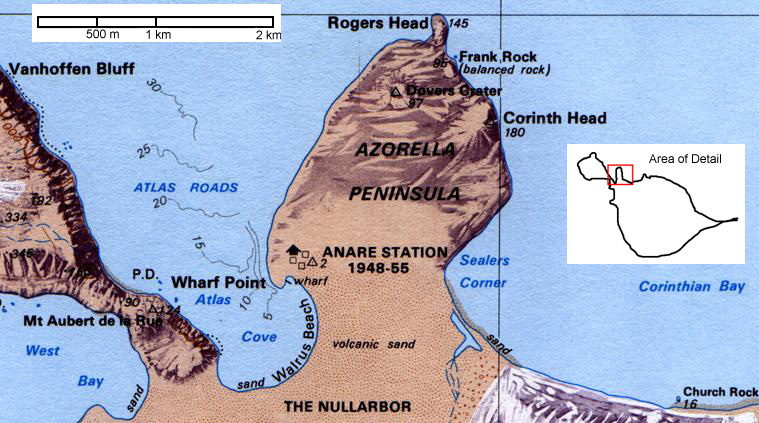 With the wind behind me, I walk the thousand meters (.6 mile) from Walrus Beach across the flat plain called the Nullarbor to Sealers Corner on Corinthian Bay. 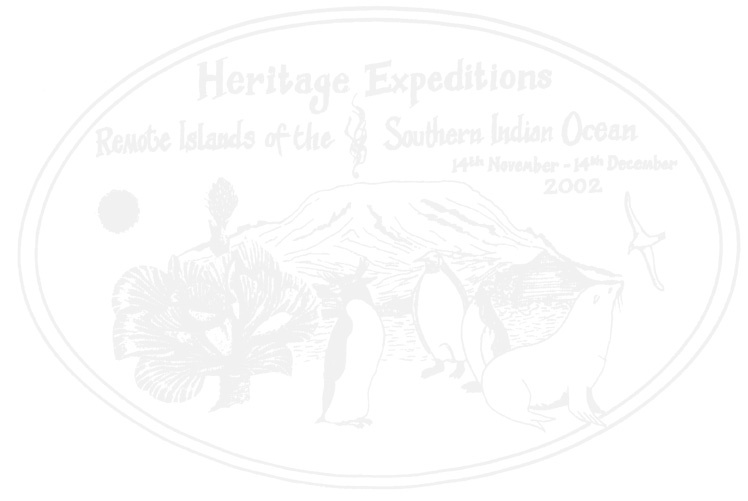 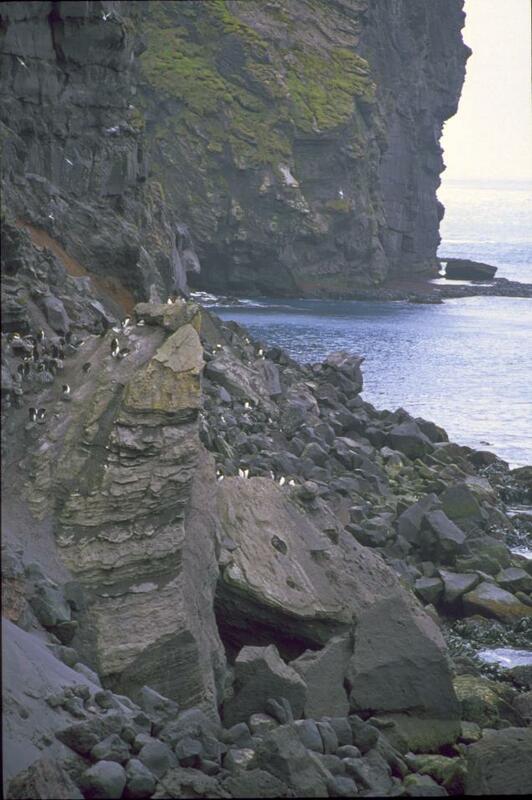 I then walk another mile north along the east coast of the Azorella Peninsula to catch a glimpse of a macaroni penguin colony. Exhilarating as it is to be in this incredible and remote place, I find the walk back into the wind utterly exhausting. 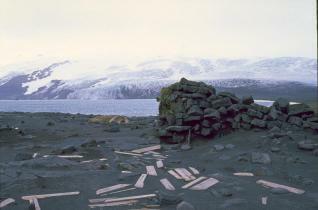 The Australian government operated a scientific station at Atlas Cove from 1947 to 1955, but the island has had no permanent human settlement since. 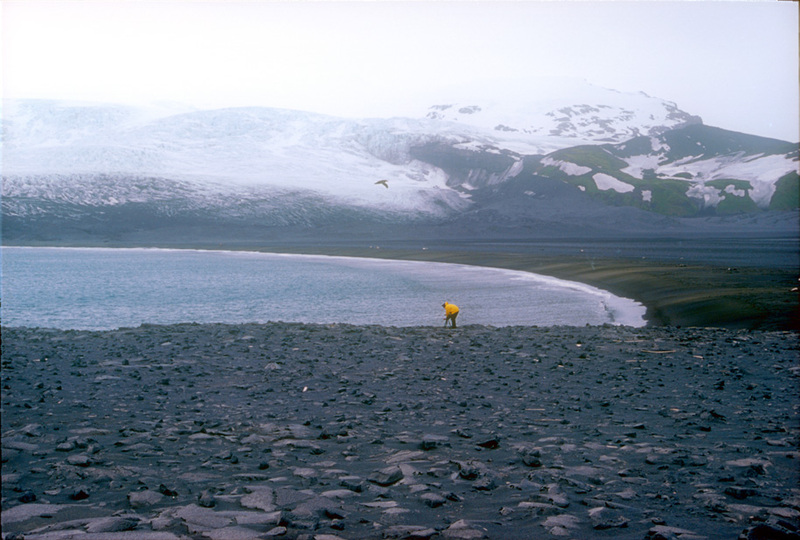 A fellow voyager sets up his tripod on the beach of Corinthian Bay against a stunning backdrop of glaciers and snowy peaks. 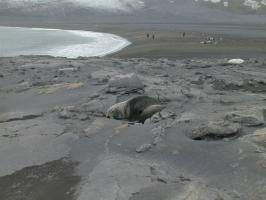 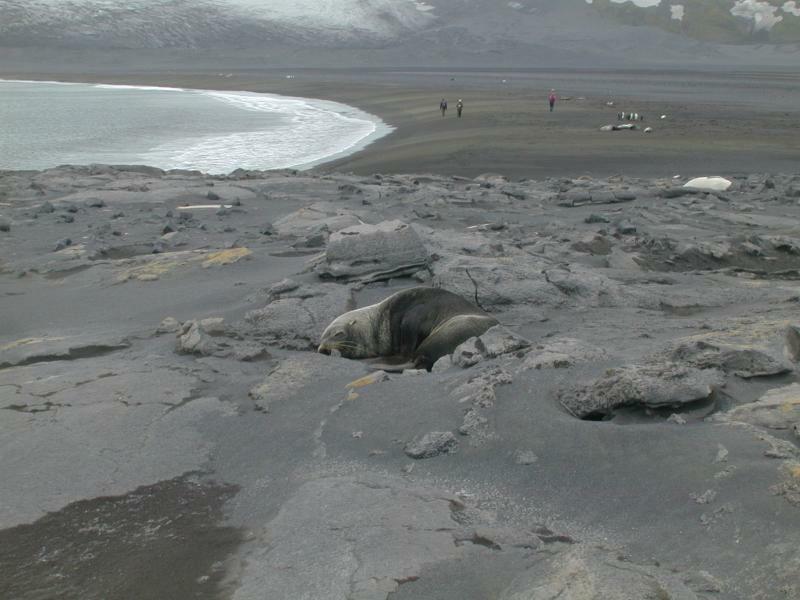 An Antarctic fur seal dozes amid volcanic rubble near Sealers Corner. 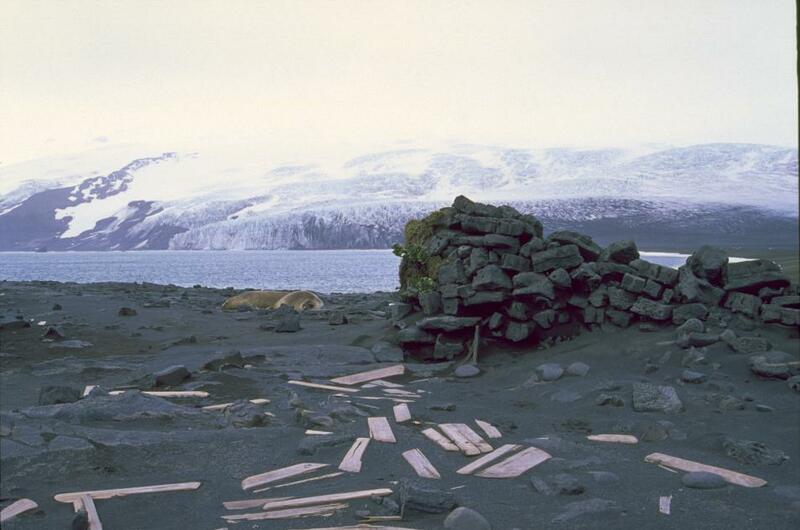 Kerguelen cabbages cling to the ruined wall of this sealer's hut dating from the late nineteenth century. 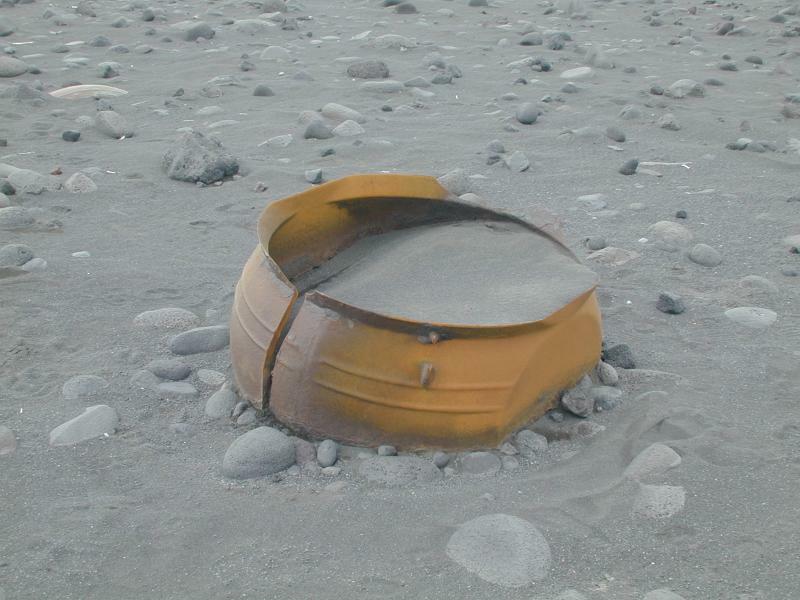 A broken trypot, now filled with sand, would have been used by the sealers to melt the seal blubber down into oil that could be poured into barrels. 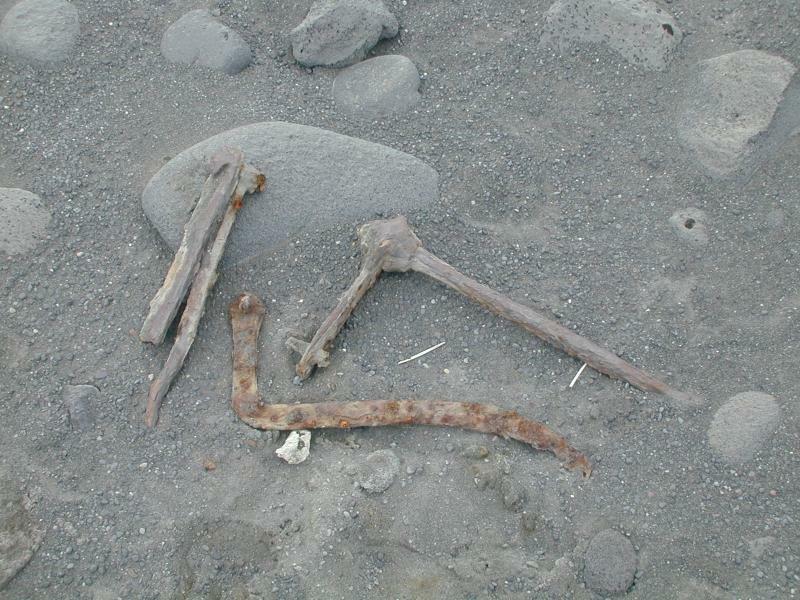 Unidentified sealer's implements lie rusting in the sand. 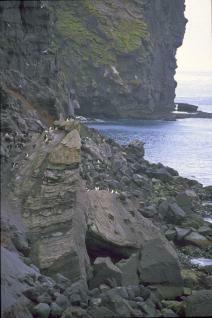 The striking rock known as Rogers Head; at its base is the macaroni penguin colony I have come to see. 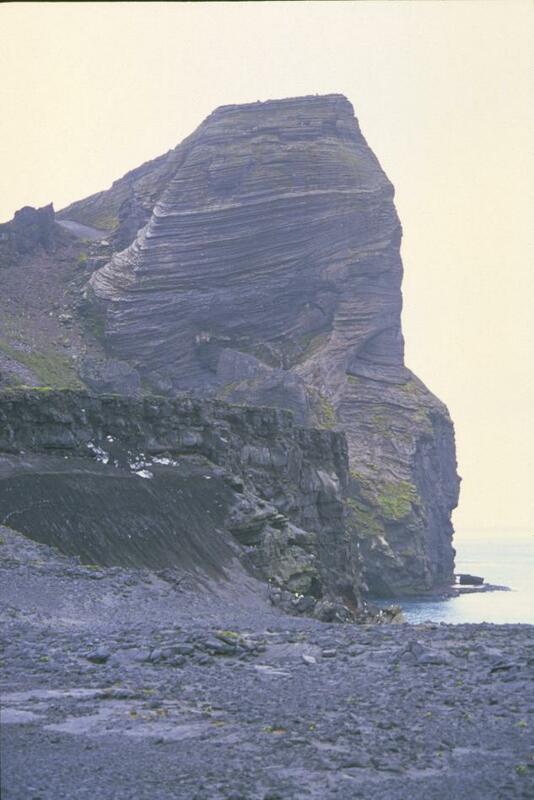 I sit on the edge of a 30 meter (100 feet) high cliff (just north of Corinth Head) for half an hour and watch the macaronis through binoculars. This is as close as my 5x telephoto lens can bring the scene to film. 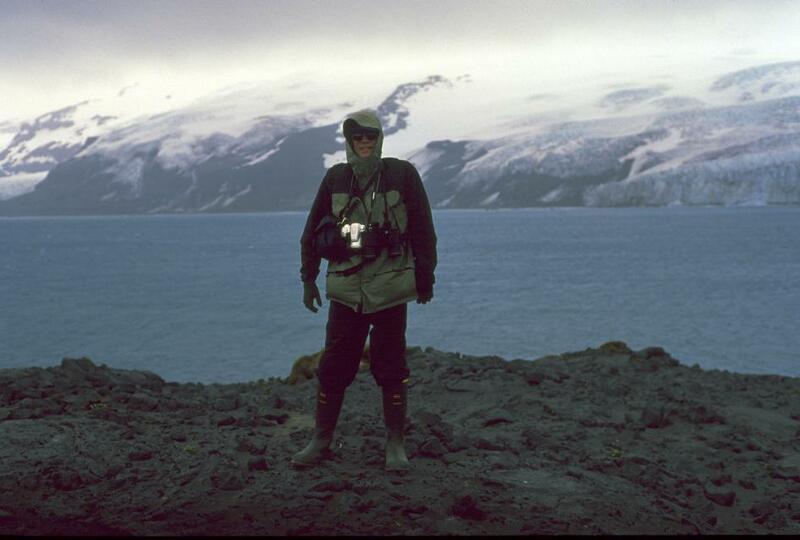 The intrepid explorer! 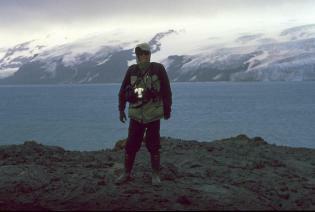 Festooned with binoculars and cameras, I pose in front of the glaciers on the other side of Corinthian Bay for this shot taken by an obliging fellow voyager (thanks, Warren!). 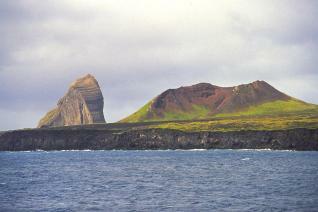 The east shore of Azorella Peninsula may look barren, but it hosts a huge number of seabirds. 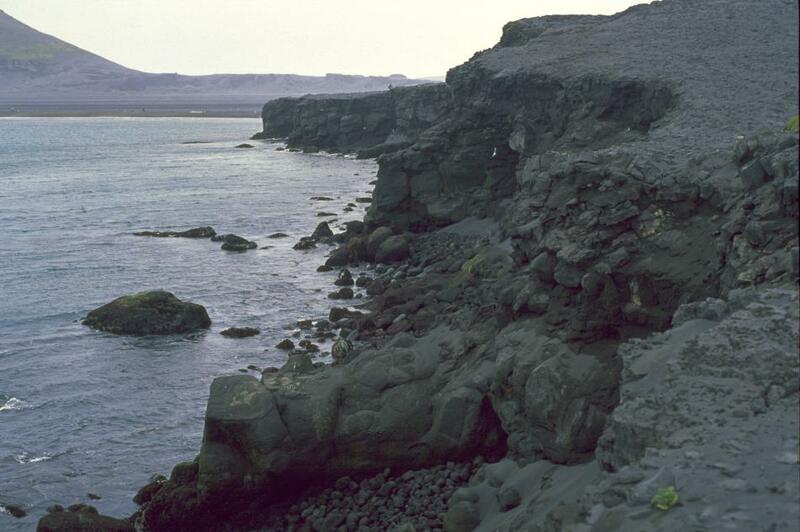 At least six birds have been caught in flight in this photograph, clearly seen as white flecks against the black volcanic rock. 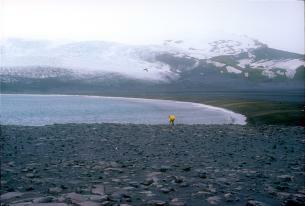 Having finally returned to Walrus Beach after the walk into the wind that seemed as if it would never end, I look back at Azorella Peninsula. The sun emerges for a moment to provide this view of Rogers Head and Dovers Crater, and an island that had seemed all blacks and grays suddenly reveals its brilliant colors in the red of volcanic cinders, the green of Azorella moss, and the blue of the South Indian Ocean.